Ten years after Hurricane Katrina, Tulane University is stronger than ever. 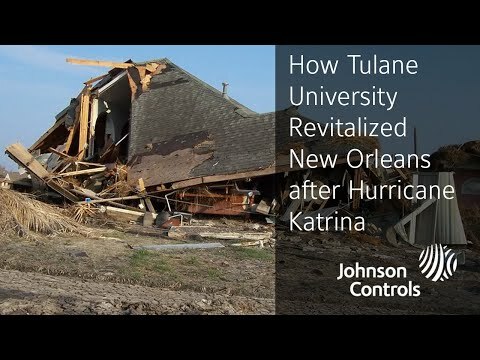 Since repairing its own damaged infrastructure, Tulane focused on helping rebuild the community–one project at a time–through a partnership with Johnson Controls. When Hurricane Katrina tore through New Orleans, family, friends and coworkers lost contact with each other. Johnson Controls could not locate engineer Wendell Wendling. Ten years later, he recounts the turmoil that changed his community forever. $1 million commitment helps Tulane University and New Orleans move forward. Tulane University, founded in 1834, is one of the most highly regarded and selective independent research universities in the United States. Following the devastation of Hurricane Katrina in August 2005, Tulane committed to rebuilding the university and helping rebuild New Orleans as a healthier, more resilient and sustainable community. Further committed to being ready for students to return to classes in January 2006, just five months after the hurricane, Tulane worked with Johnson Controls through a $40 million restoration project of its campuses. With its eye on the future, Tulane then entered two consecutive performance contracts with Johnson Controls for facility expansion and improvements, and energy conservation measures at both of its campuses in New Orleans. The result is expected savings of more than $34 million and $37 million, respectively, over the term of the contracts, while significantly reducing Tulane’s impact on the environment and strengthening the local economy. Tulane University is not only one of New Orleans’ oldest institutions it is the city’s largest private employer and its leading center of education and research. The university employs more than 5,000 faculty and staff, and serves more than 12,000 students. In addition to those employed by the university, Tulane Medical Center employs more than 1,700 medical professionals. As a result, the university has long had a major impact on the city’s economy and that of the surrounding region. Hurricane Katrina flooded Tulane’s uptown and downtown campuses, dispersing its students, faculty and staff around the country. Under the directive of university president Scott Cowen, Tulane was to reopen for the following spring semester. To be closed any longercould destroy the future of the university and negatively impact the local economy. 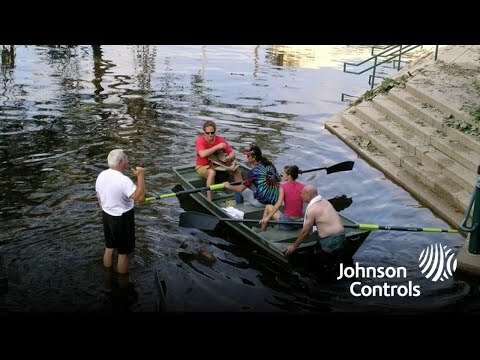 As soon as the floodwaters receded, university personnel and Johnson Controls took on the challenge. Johnson Controls brought in emergency generators to supply over 12 megawatts of power needed to get the $40 million campus restoration project under way. Then as Tulane’s prime mechanical, electrical and plumbing contractor, Johnson Controls took responsibility for rebuilding the electrical and mechanical systems across both university campuses. From ductwork to chillers and lighting systems to electrical panels, over 50 percent of these systems needed to be repaired or replaced to make the university operational in less than six months. Even before Hurricane Katrina, Tulane knew it needed to expand and upgrade facilities at the uptown campus to accommodate the university’s growth and operate more efficiently. A study done with Johnson Controls revealed that if the university were to upgrade older facilities and add more resident housing, its central plant would need to be expanded in order to heat and cool them. The solution was a shared savings agreement within a 12-year performance contract. Savings realized from improvements made under the contract are used by Tulane to reimburse the third-party, which owns the assets. If the expected savings are not realized, Johnson Controls is responsible for the difference. capacity by 50 percent and efficiency by nearly 30 percent. The new central plant serves more than 40 facilities and houses a new Logistics Department. In addition, the building itself was constructed to withstand a Category 5 hurricane, and has a built-in command center for use by key operations personnel in the event of an emergency. In addition to the central plant, Johnson Controls retrofit nearly 1,500 light fixtures and installed over 4,000 new ones in eight dormitories. Occupancy sensors were installed in dorm rooms to control lighting, and lighting in the student recreation center was upgraded. “Aesthetically we made a big improvement. Lights are softer and more pleasing to the eye. We also reduced our energy costs, which is in keeping with the university’s mission to conserve energy,” says Heather Hargrave, director of facilities services, finance & operations at Tulane. Energy management strategies were implemented campus-wide. Underground piping systems were repaired and building chilled water systems were converted to variable flow. Fan coil units were replaced in two dormitories. Water conservation measures across campus included installation of thousands of low-flow toilets, showerheads and faucet aerators, and some foot pedal operated valves. Overall improvements will reduce natural gas consumption by more than 2 million therms and water consumption by 20 million gallons annually. Annual CO2 emissions will be reduced by more than 119,000 tons. Tulane is expected to save $2.85 million in utility costs annually for the 12-year duration of the performance contract. A Johnson Controls performance assurance engineer is onsite to ensure the new systems and equipment are operating as efficiently as possible. Tulane’s commitment to energy efficiency and sustainability didn’t stop with its main campus. Situated in the heart of downtown New Orleans is the Tulane University Health Sciences campus, which is home to the School of Medicine – one of the oldest in the United States. A second, 11-year, performance contract with Johnson Controls is designed to bring Tulane more than $2.4 million in utility savings annually through facility improvement measures on campus. In the 5 years since the disaster resulting from Hurricane Katrina and as a result of remediation and renovation of downtown buildings, it became abundantly clear to the leadership of the Health Science Center that certain components of building infrastructure were in need of replacement and upgrades. An evaluation of the cost to make the improvements was completed, and the analysis concluded that the University would have to finance the project rather than pay on a current basis out of cash flow. “Various strategies for this financing were reviewed. Johnson Controls offered the performance contracting strategy in which energy cost savings resulting from the upgrades could fund the expense. Their proposal included energy savings guarantees. By such a contract, current University funding and future NIH or CDC funds could then concurrently be used for laboratory and building renovations,” said Michael A. Guidry, associate senior vice president facilities services / operations, Tulane Health Science Center. The 18-month project includes a complete overhaul of the medical school’s HVAC infrastructure designed to correct the negative air pressure condition in the building. The project includes installation of a cooling tower, water pumps, boilers, air handling units, switchgear, ductwork, and YORK chillers and variable frequency drives among other equipment. Additional upgrades include new air handling units, an exhaust system, and an expanded duct distribution system at the student dormitory. The chilled water system in the Tidewater building, which houses the School of Public Health and Tropical medicine, and administrative space will be converted to variable flow. Water conservation measures including low-flow fixtures and faucet aerators, and lighting retrofits including occupancy sensors will be conducted at the Medical School, dormitory and other select facilities on campus. Johnson Controls will implement campus-wide energy management strategies to optimize building and equipment performance and ensure savings. A service agreement provides preventive maintenance services and repairs to select equipment installed under the project. Tulane’s efforts have already gained attention. Following its dramatic rebuild after Hurricane Katrina and substantial improvements to its uptown campus, the Association for the Advancement of Sustainability in Higher Education (AASHE) presented Tulane with the Campus Sustainability Leadership Award. The award recognized not only Tulane’s numerous green initiatives to conserve resources and protect the environment, it also recognized a commitment to the social and economic dimensions of sustainability. For example, the Tulane School of Architecture has been engaged in designing and building new, more sustainable housing prototypes in several neighborhoods. Johnson Controls has made a 10-year commitment to support the program. The program is yet another example of how Tulane University and Johnson Controls continue to work together to help rebuild New Orleans as a healthier, more resilient and sustainable community.